Hello again! Today, I am here with another VoxBox review, courtesy of Influenster. Thank you so much for the opportunity, Influenster! I didn’t expect to be chosen for another one so soon. 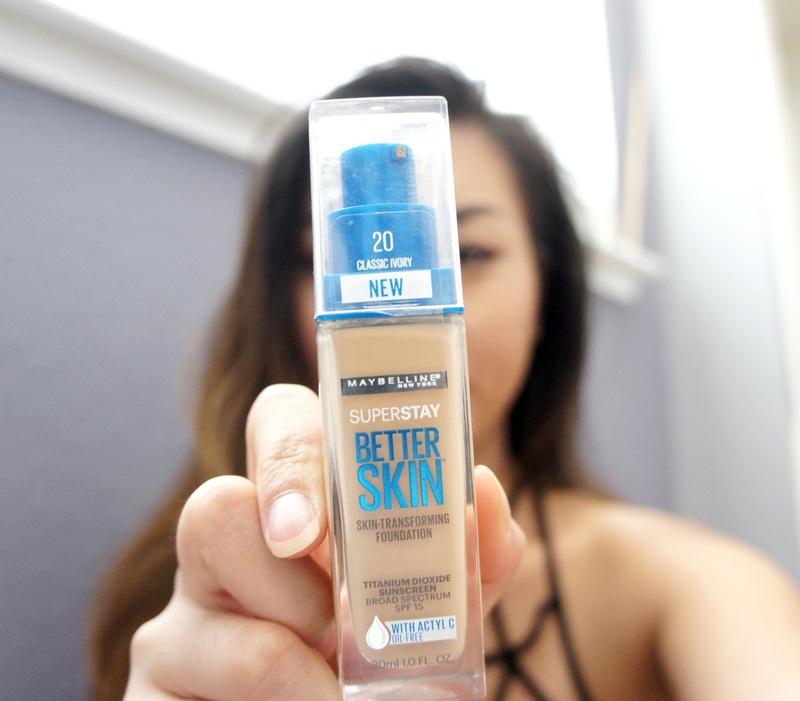 Unlike the other VoxBox review, I was only given one product this time around and I was asked to take Maybelline’s 3 weeks #betterskinchallenge with its Superstay Better Skin™ Foundation. If you have been following me on Instagram (@diemberly), then you would have seen weekly updates of the challenge. Since I received this product complimentary for testing purposes, I will compare and contrast it with other foundations that I have used in the past. When it comes to buying or trying a new foundation, I judge it based on the following criteria: shade, texture, coverage, and packaging. SHADE: As you can see, I was given the foundation in the shade, “Classic Ivory.” Surprisingly, the shade matched me really well! I often struggle with that factor when it comes to trying new foundations. In addition, at least in my experience, this particular foundation does not oxidize! I had a really bad experience with oxidizing foundation when I used Revlon’s ColorStay Foundation, which made me look like an oompa loompa. It was not a pretty look. Luckily, my shade of Maybelline’s Superstay Better Skin™ Foundation stayed consistent through out my busy days. TEXTURE: Maybelline’s Superstay Better Skin™ Foundation is a liquid foundation, but the texture/consistency is definitely on the thicker end of the spectrum. Personally, I am not a fan of thick foundation because it usually feels heavy on my face and it usually clogs my pores. It is a bit comparable to Make Up For Ever’s HD Foundation, although MUFE is less dense. For that reason, I don’t like either foundations very much. I am more of an Urban Decay’s Naked Skin and Estee Lauder’s Double Wear Foundation type of gal. COVERAGE: I would say the coverage is medium, and unfortunately, that’s not enough for me and my acne-prone skin. For the challenge, I had to apply 2 layers of foundation on top of CoverFX’s Blemish Treatment Concealer. It’s relatively buildable with the help of a buffing brush and the Beauty Blender. If your skin isn’t acne-prone, then the coverage is pretty amazing for a drugstore product. PACKAGING: I love foundations that come equipped with a pump, so Maybelline’s Superstay Better Skin™ Foundation did a great job with packaging! Also, its simplicity makes it practical, which I’m totally okay with. I used to wear Maybelline’s FitMe Foundation and its packaging was one of its flaws. Now, I usually do not judge foundations on their repair mechanisms, but because Maybelline’s Superstay Better Skin™ Foundation claims to reduce the appearance of spots, dullness, and unevenness, I will say that I did not see a difference in my skin. I have severe acne, so it takes a lot for my skin to clear up. For that reason, I am not surprised that I did not see a major difference in my skin’s condition. Furthermore, I wear and use a lot of products on my face, so I cannot pin point a specific product for its contribution because the result of my skin is due to the interaction of all my products. If I were to redo the challenge, then I would solely use Maybelline’s Superstay Better Skin™ Foundation over a span of 3 weeks to conclude an accurate review of its claims.